Concepts: ‘Iyashikei’ is a Japanese term that refers to healing, soothing the mind and nerves of the audience with a calming manner, often with an emphasis on pastoral settings and peaceful non-combative resolutions. We may better recognise elements of this in the works of Studio Ghibli, and Golden Sky Stories strives to capture that same atmosphere. 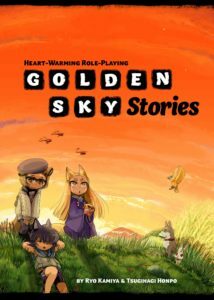 Released in Japan in 2006 as Yuuyake Koyake, Golden Sky Stories has no dungeons to loot or ogres to slay; instead, your characters are Henge, spirit animal-people, whose task is to be helpful. If you are familiar with the concept of ‘helpful faeries’ then you’ll quickly see the cultural parallels. Writing: The writing in this game, unsurprisingly, is very deeply rooted in Japan’s real-world traditions and mythology, heavily influenced by Shinto beliefs on the nature of spirits and harmony with nature. Henge are animal spirits that can take on the form of human children, with the game providing a good number of species to choose from such as cats, dogs, foxes and raccoons. Golden Sky Stories leans heavily towards rural settings, and a good chunk of the book is dedicated to discussing how to build and populate small towns for your game to centre around, all the while helping to evoke the atmosphere that you will want to create. – The village’s baker’s weekly supply of flour isn’t going to get to him due to a flooded coastal road, and asks the henge to help. As you can see, the focus of these games tend to be very focused on interacting with NPCs, causing this game to be a great choice for players that enjoy strong role-playing. Most of the games are fairly short at only 1-2 hours play-time, but they can be easily connected together to make a longer series of adventures. 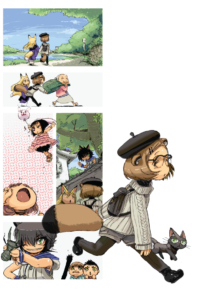 Mechanics: Character creation in Golden Sky Stories is simple – players select a type of animal spirit that they wish to be, cats, dogs, birds, rabbits, fox-like kitsuni or raccoon tanuki, each of which come with five build-in special abilities or minor powers that are unique for their animal type. The player can then purchase additional powers, but those come with weaknesses too – buying your cat character an Acrobatics ability means that you must also take the Cannot Swim weakness, for instance. The second part of creating your character is a simple points-purchase of the character’s core statistics; henge (relating to spirits), animal (relating to their animal nature), adult (relating to the world of adults – business, computers, being ‘sensible’) and child (relating to emotions, fun, charming your way out of mischief and so on). To test if a character can accomplish something, the GM nominates which of the statistics would be used and indicates a target number – often to pass this, a player will need to spend tokens which we will discuss shortly. Once you have built your character, the most important phase begins – all players work together to build a network of relationships between their characters. There are a variety of different types of relationships, such as Rivals, Love and Protective – and all are scored on how strong those relationships might be. Every player’s character is connected to each other in this way, and the relationships between two characters do not need to be the same. Each time that a player encounter a new NPC, they will be allocated a relationship and rating for that NPC. – Dream is awarded for strong roleplaying and innovation/fun things, and can be spent to increase the strength of a character’s relationships at the end of each scene. – Wonder equal to the total of a character’s relationship strength going to other characters, and is used to pay for their powers. 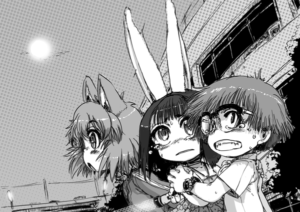 It refreshes at the end of each scene. – Feeling is equal to the total of a character’s relationship strength coming from other characters and can be spent to raise one a character’s four core statistics by one point per Feeling token spent. It refreshes at the end of each scene. Design: What the above mechanic means, in practice, is that players are encouraged to form new bonds and continually strengthen them. This means that interaction, not strategic planning, is encouraged. Let’s look at this in practice. Raccoons have a very expensive power which allows them to shapeshift into anything – anything at all. 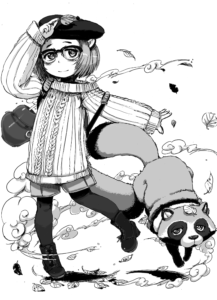 Sam is playing as raccoon character. He watched My Neighbour Totoro recently, and desperately wants to use this power to transform into a bus. He would need to spend a lot of Wonder to do that, but at the start of the current scene he simply doesn’t have enough. He sets out to earn a lot of Dream in that turn, acting especially in-character and making his friends laugh, playing up his weaknesses and so on, and then at the end of that turn he sinks those Dream points into boosting up his Wonder. In the next scene or two he should have enough to use that power. When people talk about a game having mechanics that support the atmosphere, intent and setting that the game takes place in, this is the kind of thing that they are talking about! Playability: Golden Sky Stories plays very nicely if your group of players are of a like mind and aim to embrace the atmosphere of the game. Players who struggle to imagine a game session without at least one strategic combat sequence will find this phenomenally dull, however – but to those who enjoy the back-and-forth chatter and conversation around the table, this will be a refreshing breeze. With the rules as light as they are, it is quick and easy to pick up. It would make a good game for younger players, although the cultural difference may require some explanations. Some of the most heartfelt elements are truly universal, though – the high point of our first game of Golden Sky Stories involved our characters finding a puppy, and truly there is nothing as great in life as puppies. Conclusion: Golden Sky Stories is not for everybody. Whilst it is entirely suitable for younger players, its emphasis on peaceful and non-combat resolutions may not appeal to everybody – Hero Kids offers younger players a more adventurous experience. What Golden Sky is, though, is relaxing. It is every rolling piece of landscape scenery in a Studio Glibli film. It is a cold cider in a garden on a warm summer Sunday afternoon. It is a fantastically light-hearted and pleasing experience, which leaves a lingering sense of life-affirming positivity. It is a slice of a world in which every problem can be fixed with acceptance, communication and understanding and there really is a little bit of magic in the air. FINAL THOUGHTS: A thoroughly refreshing change to the style and atmosphere of a conventional tabletop RPG, perfect for the time when you want a heart-warming taste of the simpler things in life.